We are the reputed manufacturer, exporter, importer and wholesaler of PRI Voice Logger System in the industry. This TVRS get attached to the PC or TV easily to record channel data or voice recorded during a conference or meeting. The machine is manufactured using quality approved components and parts adhering to industry guidelines with the help of modern technology. The offered TVRS is used in various government and private sector where customer voice data is important for the service provider. Aria Parth is a strong unified communication system which is widely used for recording of both incoming and outgoing calls. Aria Parth 120R is 120 channels is standalone telephone voice recording system. It can be used with ISDN PRI E1/T1/SIP/H.323 Trunk & can be connected with direct E1 line or through PBX, GSM PRI gateway etc. Aria Parth is efficient tool for call centers, corporates, and financial originations to keep record of telephonic conversations. The system can record all incoming and outgoing calls routed from PRI and VoIP lines. It can be connected with direct E1 line or through PBX, GSM PRI gateway etc.can be used with ISDN PRI E1/T1/SIP trunk. · Support incoming/ outgoing/DID no. 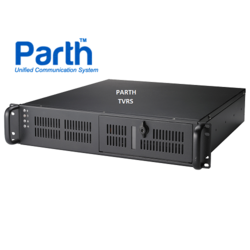 Parth TVRS is embedded telephone recording system which can be used with ISDN PRI trunk. The system can be connected with direct E1 line or through GSM PRI Gateway, PBX.